WHY? Everyone remembers the date of something special: birthday, anniversary, the day you met that someone special, the first kiss… people want to celebrate them with special details. This is the main reason for 3D FOOD for special dates. WHAT? The code of this App generates a personalized design from your special date and let's you download a Gcode file that 3D food printers understand. The personalized design is based on 2 shapes (inner and outsider). Step 1 – Choose your special date. Step 2 – Click the “get your 3D FOOD design” button. Step 3 – Visualize your design. Step 4 (Optional) – Modify the 3D printer parameters and 2.5D design parameters by clicking the settings button. The main parameter you can choose is the number of layers that the gcode file (by default are 8 layers) will include. WHY THE GCODE FILE? G-code is a language in which people tell computerized machine tools how to make something. Once the GCode file is fed to the machine it is able to move and extrude with 3D printers. The default measurements of design on your downloaded gcode file is 100mm X 100mm maximum. You can check your gcode file by using Repetier (software to manage 3D printers). 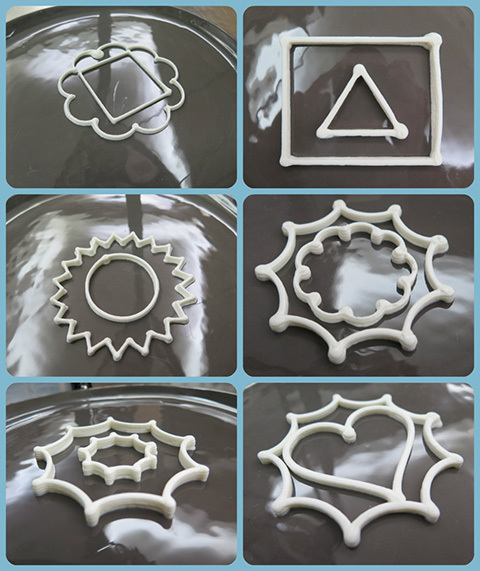 With this file and a 3D food Printer you can make desserts like this! !